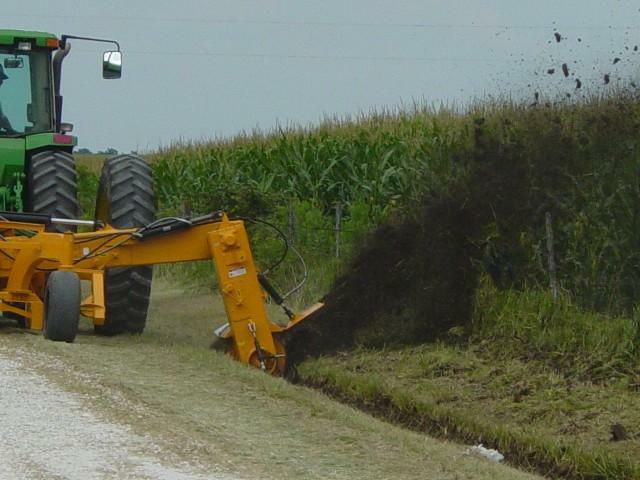 The Ditch Angel is a right-hand side-arm ditcher designed for cleaning and maintaining roadside ditches. 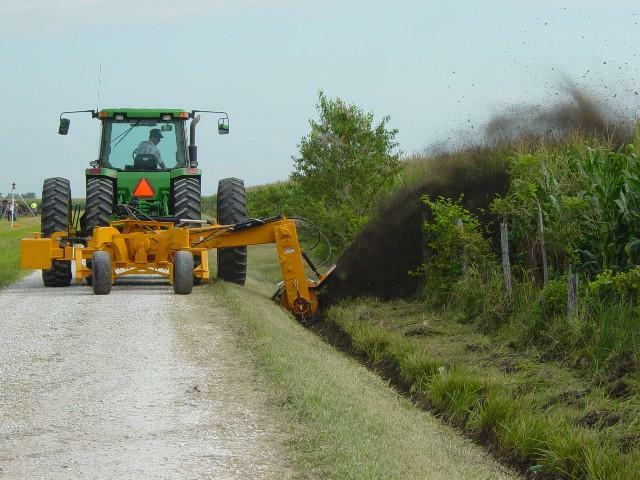 The ditcher operates in dry or wet conditions and throws soil out the right side of the machine over a 50 foot area; rocks and other debris may go farther. The Ditch Angel has a standard 26\" 5-paddle impeller (digging wheel) with hard-surfaced paddles designed to be resurfaced as they wear. The impeller contains a shear bolt to protect the ditcher and tractor should an immovable object be struck. The ditcher can be operated at a distance of 5 feet to 11 feet from the center of the tractor and at a depth of up to 5 feet. The arms (gearboxes) contain large shafts, heavy-duty sprockets and bearings, reversible gear drive, and double 80 roller chain. Each arm contains oil for chain lubrication and an external idler adjustment to maintain proper chain tension. 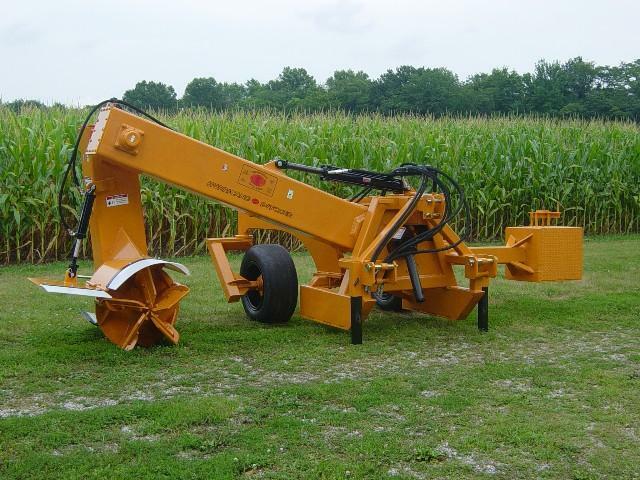 The Ditch Angel is Cat II or III quick hitch adaptable. With the optional tail wheel assembly, the top link is designed to telescope allowing the machine to float, instead of being hooked rigid, while being operated on rough terrain. The standard counterweight is manually adjustable. The optional tail wheels (crazy wheels) help support the weight of the machine and add stability while operating the machine. 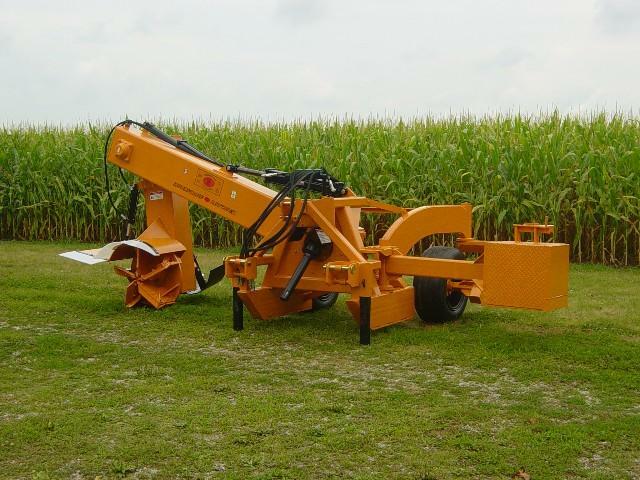 Options for the Ditch Angel: hydraulic deflector (allows control of soil throw from inside the tractor cab); deflector extension (allows soil to be bermed or piled close to the ditch rather than thrown); tail wheel assembly; 540 RPM PTO.